filipinos are known for our hospitality and our take-life-as-it-comes attitude. we do with what we have and have always adapted to the changes in our lives. that is why, amidst poverty, we still have these big smiles on our faces. after all, life is too short, might as well live it right? introducing the no. 1 mode of transportation here in the philippines — the jeepney. the jeepney used to be old jeeps that the americans left in our country after world war II. to easily travel through the war-ridden roads, the filipinos stripped down these jeeps to accommodate more passengers, added tin roofs and decorations in vibrant colors. when i was a student, i rode the jeep everyday and to wherever i need to go. with student allowance, it was much better to use our money on food and fun rather than spend them on taxi fares. as a kid, i was always so amazed at how the driver can drive the jeep, take the fare from the passengers and give them change, all while watching the road. 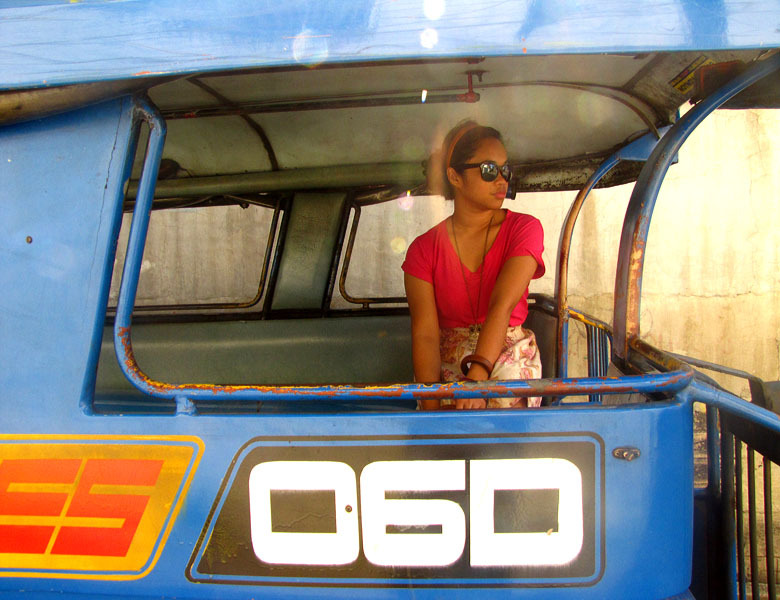 i used to love riding jeepneys on peaceful afternoons — where everyone is at work or in school. the roads were open and the wind was on my face. jeepney bonding was great too — just laughing it off with classmates while in traffic. i have to admit though that i am not a big fan of some jeepney drivers who speed up and just pop out of nowhere nor riding jeepneys during peak hours like 7:00 – 8:00 AM or 5:00 – 7:00 PM as these times can be a nightmare. despite these setbacks, i am still proud that once upon a time, filipinos were given lemons and made lemonade — or in this case, we were given used american jeepneys and made a great mode of transportation. ps. i might take a little blogging break because i think i have dislocated my right shoulder blade. it has been hurting for a month and the pain has now reached my arm so i have a hard time moving the mouse. for the past few weeks, i’ve only wanted to just lie down and watch tv instead of blog and i think that would be unfair to my readers if i don’t say why i’ve been slacking off. i will make sure to read your comments though. let’s just hope that after my check-up with the orthopedic tomorrow, all’s well with my shoulder and arm. i’ll miss you guys! jeepney just like tuk-tuk at thailand.hehe. 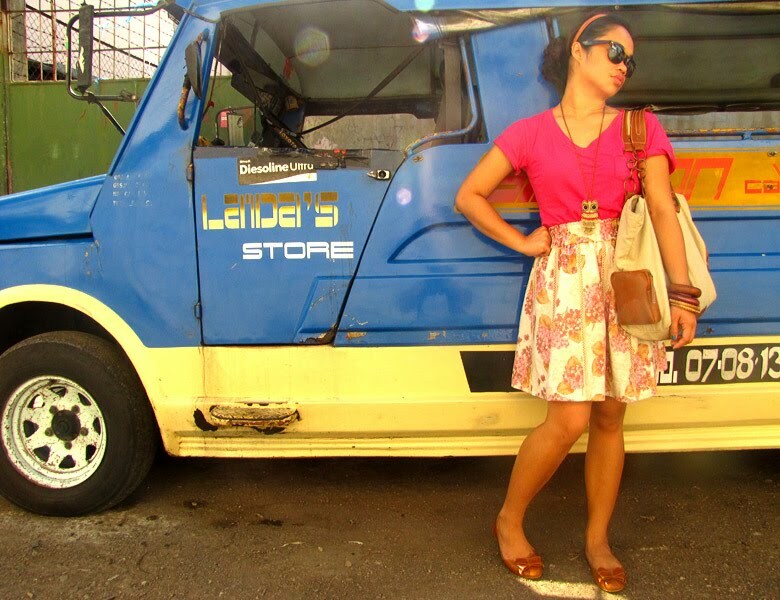 love your photos posing with jeepney and cute outfit too! you look great in hot pink giselle ! wow nice shoes!I love parisian Jr. as in love!love!love! I love that they have a wide range of flat shoes, sandas, and heels! sorry to hear about your arm, hope you recover soon! you look gorgeous, love your skirt! i love the colorful outfit esp. the skirt. so nice to learn things from countries so far from mine!lovely colours in your pix! 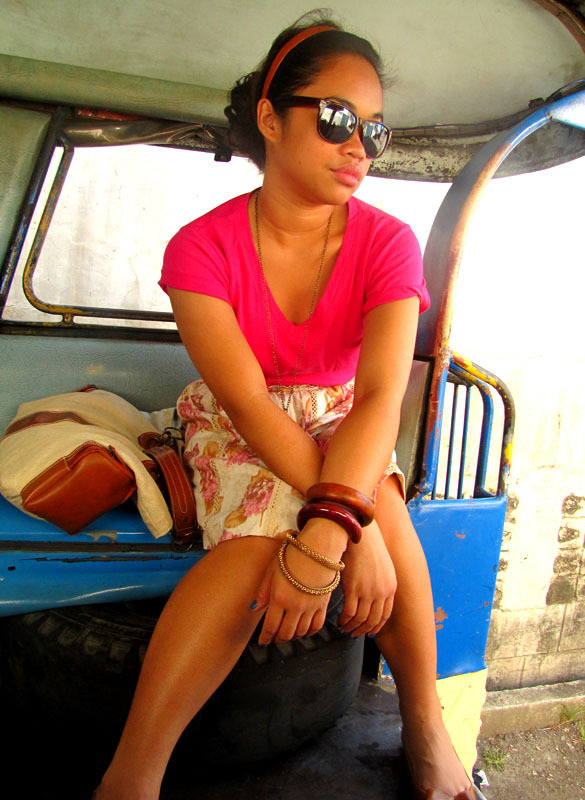 Love this post and the jeepney! Thanks so much for your shopping tips, I love Ayala especially the shop there called Cocoon. the flat seem so comfort..
i too have a photo of me hanging from a jeepney lols..
but with the heat a jeepney ride becomes excruciating! Love your outfit!! Pink looks good on you. Never heard about jeepneys before, but I would like to ride in one! Soory to hear about your shoulder. Hope you'll get better soon. That necklace is so cute! I am obsessed with anything that has owls on it. This is something I love about you your love for bright colors and they look amazing on you!!! I wish I could say the same hahahaha! I miss jeepneys! I get crazy stares from people when I get one one thought so I usually dress super dowdy because Im always afraid of getting mugged.. lol. Ill be in Cebu very soon! You, me and Eden date! 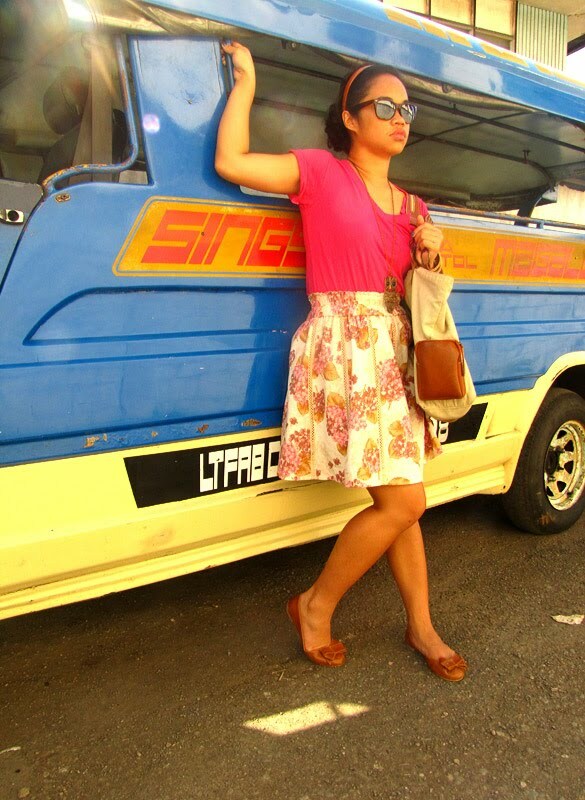 i love these shots of you posing with the jeepney! you look adorable in that outfit and it's so summery. i love this deeply personal post… your “make lemonade” attitude truly shines through. in nigeria we have modes of transportation like that as well – crowded and hot but such an experience. 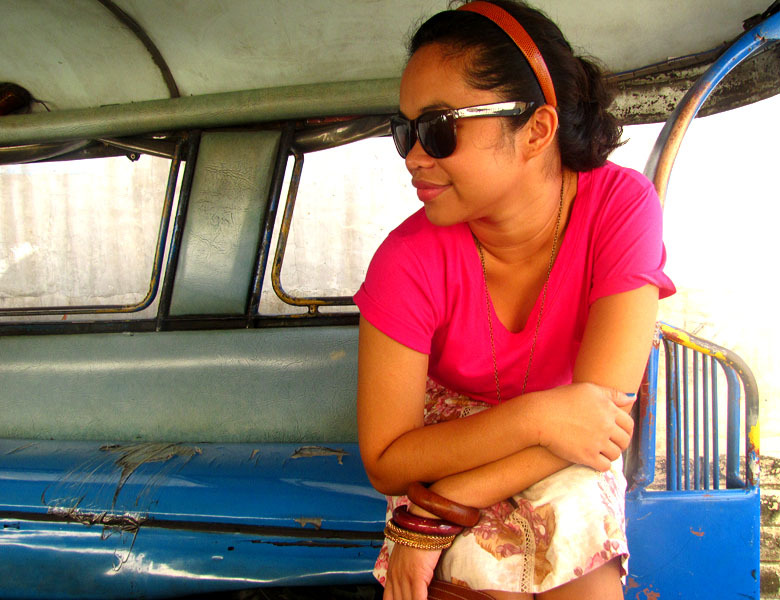 your bright and sunny outfit works perfectly with your jeepney ride! you look great in bright pink! Cute outfit & great photos!